Leap into a game where the characters and the drama are at the heart of the story, where the action is fast-paced and the dice roll freely. 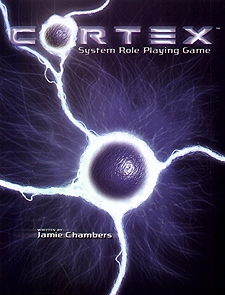 The Cortex System Role Playing Game offers you a fun set of rules that are flexible enough for any genre, setting, and storyline you can imagine. Character creation lets you run with a concept and be ready-to-play in less than half an hour. The rules make it easy for new players to understand, and allow the Game Master the freedom to improvise when the action takes an unexpected turn. The Cortex System rules provide a simple, intuitive foundation upon which the rest of the game is built - everything from an honourable duel with swords, the repair of a starship engine, psychic powers, criminal investigation, and anything in-between. This book takes a tool kit approach, with all the rules needed to play and a host of options and add-ons. We give you some examples, and a whole chapter full of advice, - but the rest it up to you. Bring your dice, some friends, and your imagination to play in a game with no limits.